Organized by the newly forming Global Poker Strategic Thinking Society, this workshop combines open philosophy, Internet strategy, instructional entertainment, and vision of a line of development for integrated real and virtual education fueled by human interest in mastering games of skill, poker in the lead. We will begin by distributing in advance of our workshop a paper on education in virtual worlds. We will aim our trajectory going forward as projection of a new way of thinking embodied in the learning and understanding of a game. We will demonstrate the teaching of the game to beginners. We will talk about why it is a good idea to teach poker to kids. We will demonstrate transition to an integrated real and virtual Internet environment. We will introduce team play. Lastly, we will examine the critical issues surrounding poker and other games of skill in education and beyond. What are the key strategic thinking points of departure? How far should we go in promoting poker in the field of education? Should poker be taught to children on the $100 laptop? 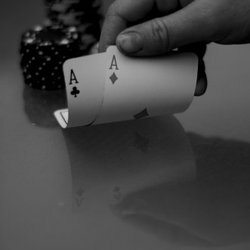 Can poker and poker strategic thinking serve as a departure point for openness on the Internet, global education, and beyond? We do not expect any previous knowledge of poker, and invite those with a willingness to learn.